A bench looks south from Table Bluff across the Eel River delta, where lines converge beneath the Milky Way at the edge of the Pacific Ocean. The sun had set at 6:30 p.m. and this photograph was taken at 7:58 p.m., just catching the tail end of a colorful sunset along the horizon on Oct. 17, 2017. 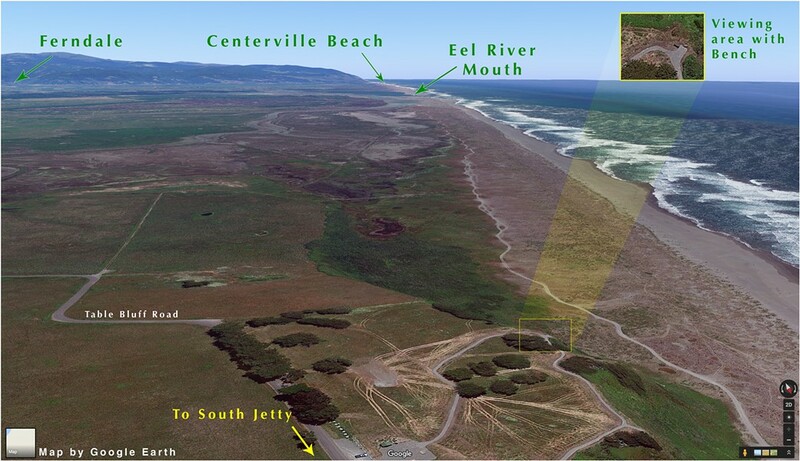 If you have ever driven to the South Jetty of Humboldt Bay, then along the bluffs just before the road descends to the ocean level, you will have passed by Table Bluff County Park. The park is graced with trails, a broad field, trees, benches and, of course, great views over the Pacific Ocean and out across the Eel River delta. Information signs provide historical and ecological context. And at night you can see the Milky Way. 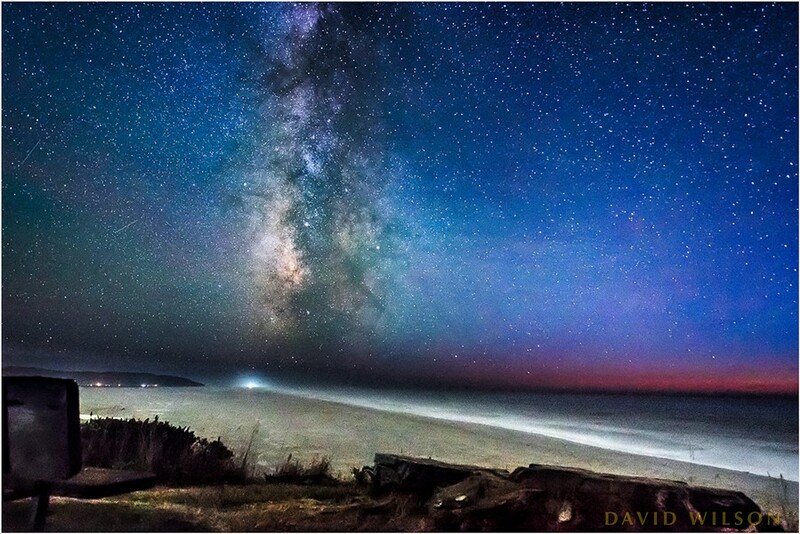 The clearest skies for stargazing usually aren’t along the coast, but coastal folks aren’t left entirely in the dark. I have found many a night sky crowded with stars along the Pacific, and when the Milky Way is out it is plainly visible, once one’s eye has become accustomed to the night. On the evening that I took this photograph it was my pleasure to accompany Erica Botkin’s Digital Photography class from College of the Redwoods on a field trip to share my nighttime photography expertise as a guest photographer. We chose Table Bluff for its proximity, with the hope of catching a view from the bluffs of the stars over the Pacific. Google Earth view looking south from Table Bluff County Park, in the foreground, with the Eel River delta in the distance. Google Earth screen shot fall 2017. Much about night photography is different from shooting in the daytime, and there is a good deal of seat-of-the-pants estimation during shooting. I won’t attempt to teach the whole of it in these few words but I’ll mention some of the things that came up for us. The camera’s light meter is fooled by the low light and gives completely false readings, which if one doesn’t compensate will lead to dark images. How much to compensate will be a matter of experimentation. Light has a very different palette at night, both in the extremes of brightness and shadow and in the quality of colors, and it requires some experimentation to get a feel for it before one can predict results. Fortunately, we are spoiled in this age with the ability to see the image immediately, so trying different settings doesn’t take long. I began my own photographic journey using film, which was expensive both to buy and process, and it took hours or days to see the results. I don’t long for that. It is too dark to focus easily at night, especially at infinity, which is where the stars are. The camera’s autofocus can’t lock in on the stars, so one must disable it and focus manually. Focusing on the stars is not necessarily as simple as turning the focus ring to the farthest. It may be that some lenses work like that, but I find that I need to back my focus off a “smidge,” which is photographic jargon for “a little bit.” So how much is that? Well, it’s not much. All I can say is, take a shot and then examine it for focus on the camera’s LCD. When examining your LCD for focus be sure to zoom in to 100 percent because if you view it too small it’ll appear that the image is sharper than it really is. An unexpected focusing issue we encountered was that on some lenses the focus ring turns infinitely, never stopping at infinity. This required a little more shooting to find the right focus, as one couldn’t simply turn the focus ring until it stopped and then back off a tad. A good camera support is crucial. The low light at night often requires very long shutter speeds, which necessitates a tripod or other support to keep the camera stable while the shutter is open for many seconds or minutes at a time. Immobilizing the camera during long exposures is very critical, and for that I recommend as sturdy a tripod as you can afford. If possible, avoid touching the camera by using a remote shutter release or use the self-timer so that any vibrations caused by pressing the release button will be stilled when the shutter opens. Some of the history of the Table Bluff Light Station, including old photographs of the many buildings of the installation, can be found at Lighthouse Friends, http://lighthousefriends.com/light.asp?ID=62. Note from the Google Earth image that no buildings remain. Wikipedia had an entry as well with additional information.